Tonight marked the first of two nights of Cast Member previews of Rivers of Light at Animal Kingdom. We were lucky enough to be in attendance for the debut of this long-awaited show. Here are our thoughts on the show. Please note that this review will contain spoilers. When we entered the Discovery River amphitheater we noticed a different flood lighting scheme than Jungle Book: Alive with Magic (JB:AWM). More of the trees were covered and the colors gradually changed from blues to purples, oranges and reds. All were soft changes and the Indian/Asian inspired music was just as unobtrusive. This is a welcome departure from the DJ that played prior to JB:AWM. In addition to the soft color changes, there were points of light that looked like fireflies in the trees by Flame Tree BBQ. The firefly effect was accomplished by high powered lasers. As we got closer to the start of the show, we were able to hear some animal noises from across Discovery River. Elephants and monkeys could be heard and eventually seen in the form of shadows walking across the trees. Approximately 10 minutes prior to showtime, we saw the 4 smaller lotus flowers start to glide into the middle of the river. They moved wonderfully across the water and the colors were very impressive. The show begins with an elaborately dressed male and female walking down the aisles on both the Asia and Dinoland seating sections, respectively. Each was carrying an elaborate staff with different lanterns on the top. The lighting then dims and a male shaman plays a horn in the Asia section. A female shaman responds and plays from the Dinoland section. They continue to play as they make their way down the aisles and to boats docked on either side of the seating sections. At this point in the show a narration plays that describes how Earth is unique among the planets of the Universe in that we have a special combination of water and light that tells our story. Of all the gleaming planets in our vast universe, it is only here on Earth that water and light harmoniously unite to create the wonder of life. We most graciously welcome you to a timeless celebration of water and light with roots as far-reaching as time itself. 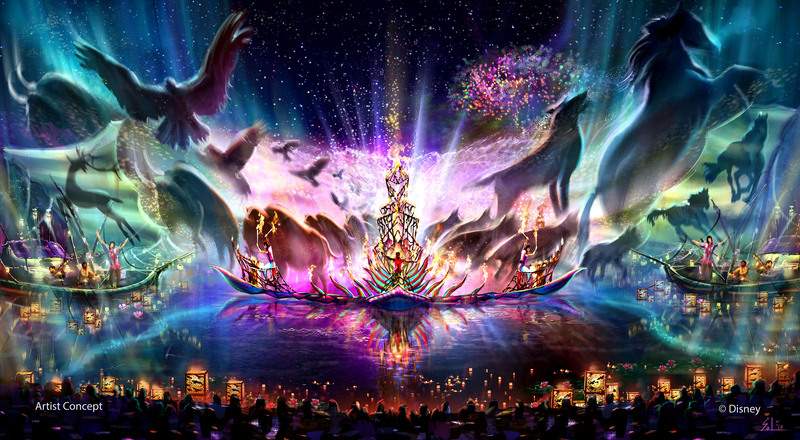 Here, where the forces of nature meet in harmony, the spirits of the animals are freed to dance together in the night sky, creating Rivers of Light. We are united in this special place to celebrate the magnificence and wonder of all living creatures, for in life, we are all one. The male shaman represents light and the female represents water. The narration goes on to describe how both intertwine to tell our story. As the boats that the shaman are on move into the middle of the river, some impressive shadow projections and puppetry take place on the sails of the boats. The first part of the show was fun and engaging, but it’s the second half of the show that the storyline introduced of water and light fades away and basically a series of projections of animals starts to play on the giant water screen. The 4 original lotus flowers start to produce beautifully colored streams of dancing water out of the middle. In addition to the water streams, each lotus flower contains a water screen and projector on board that allows them to project a strong and clear image unique to each float. I wish I could write more about the theme or story, but it just isn’t there. The music is beautiful and grand, with an overarching theme of being one with nature. Again, the whole time there is dancing water streams, a montage of animals on the giant screen, and animals projected on the individual lotus water screens. Probably my favorite effect of the evening was when multiple lotus floats would line up and animals would jump from one water screen to the next. It was very convincing and well executed. A single, much larger lotus centerpiece was introduced from behind the giant water screen, but doesn’t add a whole lot to the show outside of some higher water streams and larger water screens than the 4 smaller lotus floats. The ending of the show included a crescendo in the music, a projection of the animals into the stars to form a sort of constellation, and a giant metal stem rising from the centerpiece lotus. I was a little disappointed that there were no effects introduced to the stem, but maybe that’s still a work in progress. My second favorite effect behind the jumping animals, was that the Tree of Life was used in the finale, with beams of light coming from within the branches and extending into the night sky. The show clocks in at roughly 18 minutes in length. So my personal thoughts. Overall, the show reminded me of Illuminations: Reflections of Earth. It was a very conceptual show that contained a hodgepodge of elements and projections that highlighted the concept of Animal Kingdom, that is, being one with nature. There really is no storyline and (unlike Illuminations) the lack of any pyro means that the “wow moments” rely on some of the stunning visuals instead of loud explosions or fire. The technology involved in producing this show is as impressive as it is fickle. When the show was stopped, it was ugly. The projection on the water screen froze and all of the floats stopped moving. If this happens in front of guests, it will be a nightmare. Hearing a Cast Member who had some in depth knowledge of the show, the point at which we encountered the show stop was a “fairly unique” point. According to the Cast Member, the show normally stopped at around the 13 minute mark due to a float being unable to maintain its position. It is because of the technology and the fact that we encountered a show stop tonight that I fear a public opening might not be for quite some time yet, but who knows. It is worth noting that the Cast Member seated near us who worked on the technical elements of the show said he had seen it run smoothly about 30 times. Again, hearsay, but relevant given that this was a Cast preview and “backstage” talk wasn’t uncommon. The colors were amazing. It’s a beautiful show to watch. The 11 elements (4 small lotus floats, 4 animal floats, 1 large lotus, and 2 shaman boats) were always moving which made for a wonderful ballet of sorts. The water screens and projections were an upgrade from Fantasmic. Even the giant water screen used a combination of stronger projectors and lasers to produce images of greater quality and clarity than what we saw with JB:AWM. The shaman and animal floats played too small of a role. Outside of the first 3-5 minutes, we didn’t really get a great look or performance from the shaman and the story of water and light was lost. Also, the animal floats, while colorful and beautiful, were far from the attention grabbers that I had hoped they would be. The music was wonderful and catchy at points, and subtle at others. I felt like it was a good fit for a nighttime show at Animal Kingdom. We drew some similarities with Illuminations earlier, and I think the soundtrack is another great similarity. I will say that the catchy parts of this soundtrack are better than Illuminations and serve to create a fun atmosphere. Overall, the show (in its current form) has the ability to underwhelm guests. It will be a beautiful thing to watch and the technology involved is very impressive, but will have no lasting effect or payoff for the guest. I hope that what we saw tonight wasn’t the finished product, or if it is, Disney continues to work on a version 2.0 of the show immediately.